It was a fine (month) day , with light winds & (state) tides that were a perfect time for a spot of fishing after work. 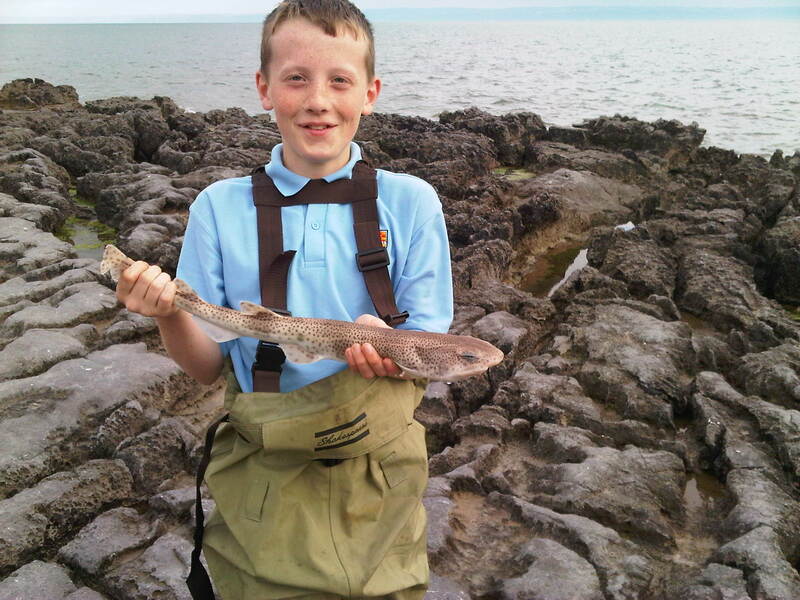 i shut the shop and headed to a well known local high water mark, Ogmore by sea, in particular ogmore Deeps ( so called because of the depth of water over high water ) with my son William to fish for a couple of hours either side of high water. having parked the car , we took the short walk to the ledge we were to fish. from the path above we could see the calm sea state, a good sign, as this woould mean that certain species of fish would be more likely to be present feeding . Unfortunately it looked like several other anglers had had the same idea, as the 2 spots that i was hoping to fish were already occupied. so i took the decision to fish a spot directly below were we came out from the path. the ledge looked dry,high and flat, so would be safe to fish over high water. we clambered like mountain goats down to the chosen ledge and set up the Salt stand . our 2 beachcasters , 15 ft fixed spool rods were assembled with 7000 size fixed spool reels filled with 15lb low diameter monofilament. end tackle consisted of a mixture of pulley pennel and fixed rigs with 3/0 aberdeen hooks as the main hook and a smaller 1/0 aberdeen as a trailing or pennel hook. weights used would be 5oz (150g) grip leads, as the tidal rush, especially on the down is strong enough to pull lighter weights out, sending you tackle down tide. Baits used would be cocktails of peeler crab, fresh sandeel, farmed ragworm and blast frozen ammo unwashed squid. it was about an hour and a half before top tide when we cast the first baits out, the calm conditions allowing us to cast our baits quite easily into the Bristol Channel before us, and it wasn’t long before we had our first bite. Wills rod tip twitched, then proceeded to nod, a sure sign of a Dogfish bite. quickly Will grabbed his rod and struck into the fish,reelinng as he did. Sure enough a Dogfish came to the surface and was landed, Wills first. By now the tide was an hour into the down, so the rip was well and truly on. Perhaps it was a ray, kiting in the tide, or my lead had just broken out in the verocious pull of the tide. I reeled in the slack and struck, feeling the weight on my tip. There was obviously something on , so I slowly reeled in , pumping the rod so that the blank took the weight, not the reel. The line had gone a fair way down the tide, so lucky no one was fishing to the right of us, otherwise I might have brought their lines in too. At 30 yards I could clearly see it was a fish, thrashing on the surface, but couldn’t make it out. It was definitley something I hadn’t seen before, so I kept winding, being careful to keep the tension on the line so I didn’t give the fish chance to throw the hook. . As it got closer I could make out the Blue of its back and that was when I realized that the fish on the end of my line was a Bass, bigger than any Bass I had had before. As you can imagine , once this became apparent, my heart started pumping out of my chest and I got quite excited. Although the fish was making a commotion on the surface, it didn’t actually fight much, so I just kept the tension on the fish. By now the tide was about 2 hours down, so the rocks below the Deeps were expose enough for me to get down to the waters edge. After climbing down,all the time keeping my line tight to the fish I managed to get the fishes’ head up in the water. Once I had managed to get the Bass as close as possible I managed to slide my right hand into the gills of the fish and drag it from the water, still kicking. I had done ! a personal best bass. Carefully I climbed back up the rocks to my stand and the waiting William. The hook was removed from the bass’ mouth, where it had set firmly in its lip . , and the fish placed in a nearby rock pool so it could quieten down and I could get my breath back. 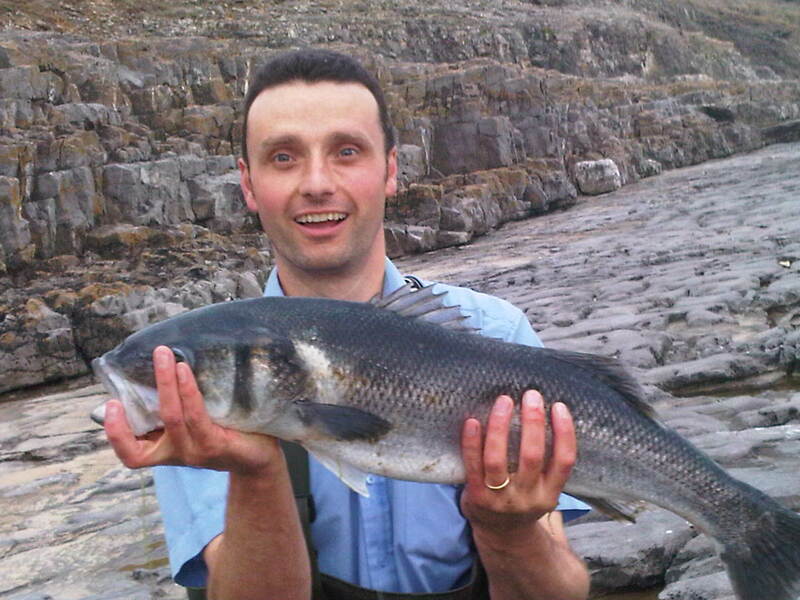 I jumped around the rocks, shouting excitedly in triumph that at last I had caught my fish of a lifetime. Unfortunately I didn’t have a scale in my box, and by then there wasn’t anyone left on the Deeps who had a scale either . I did have my match measure, the fish was roughly 5 inches across the broadest part of the back and 32 inches in length. Having had my picture taken with it I decided since the fish was in such good condition that we would release it, which pleased my son William who wasn’t keen on watching me dispatch it, and to be honest, I can’t say I was looking forward to doing it either. On closer inspection I was impressed with just how beautiful these fish are up close. I can now see why they are a much prized trophy for specimen anglers .Before I set about releasing it, Darren Gregory , Son of Steve had joined me to see what I had caught. He had been in the middle of taking some pictures for the Team Ammo website, so was glad to take a few of me holding the Bass and then releasing it back into the sea, to swim off, the perfect end to a perfect day. There was still time left to fish, so another bait was dispatched. Last cat for William the rod tip shuddered, then arced over, and Will was again into another decent fish. 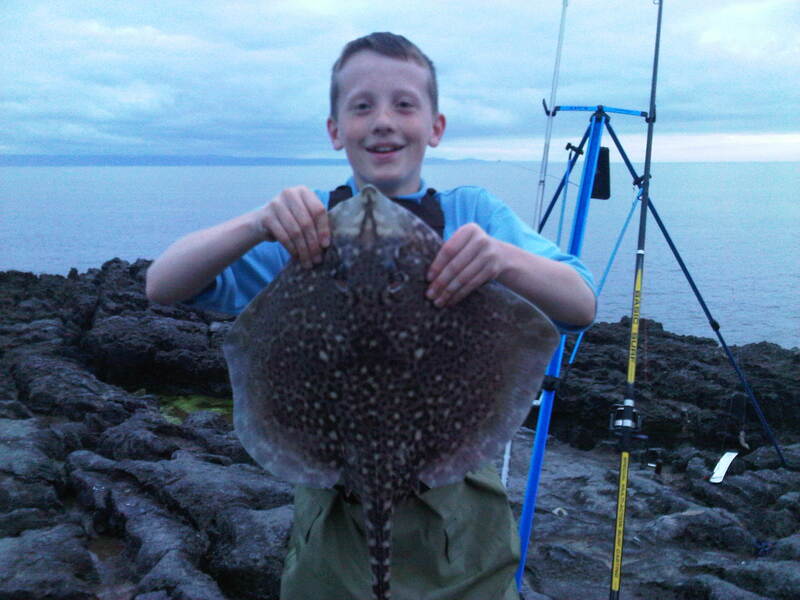 Afer a short fight, a Thornback Ray came to the surface, another first for Will, caught on Sandeel , weighing roughly 4-5lb. All in all a fantastic fishing session. 4 species. 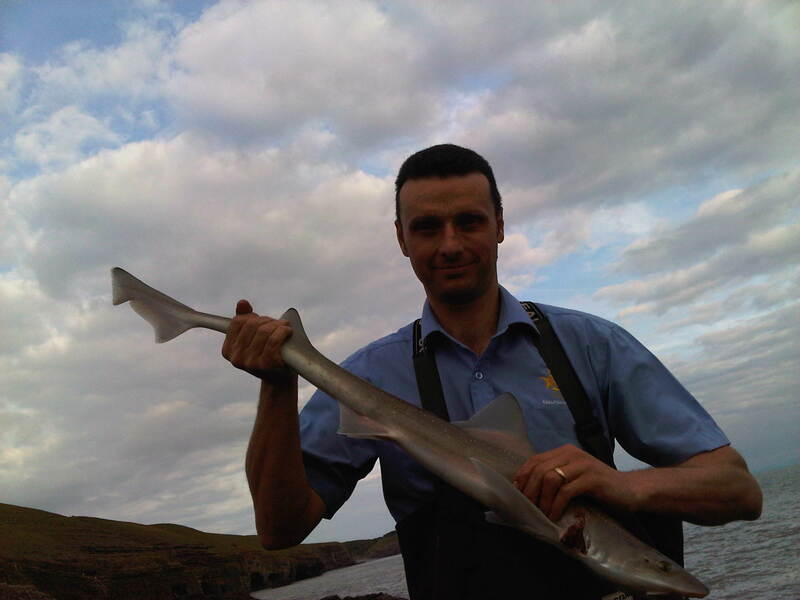 There aren’t many venues where you can catch as many species as you can at Ogmore Deeps. I don’t think people realize just how lucky we are to ave such a fantastic stretch of Heritage coastline right here on our doorstep.